Well, its been a while but things have finally started to slow down around here to the point where we can creatively cook again, just in the nick of time too. Our annual fourth of July camping trip is coming up quickly and just like years past we are in charge of one meal. In preparation for this year I thought I would get ahead of the game and actually try cooking something at home before we head out. 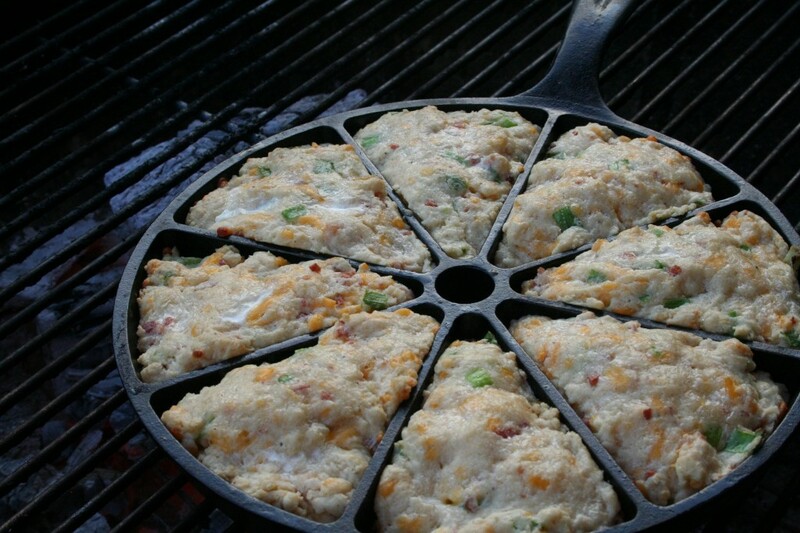 In addition to the meat and dessert, which you will likely find on here at the end of the week I am making Bacon Cheddar Cheese Scones on the fire, nothing like tending an all day fire for the meat in 100°F weather. So to practice I got a bag of lump charcoal and fired up the grill. 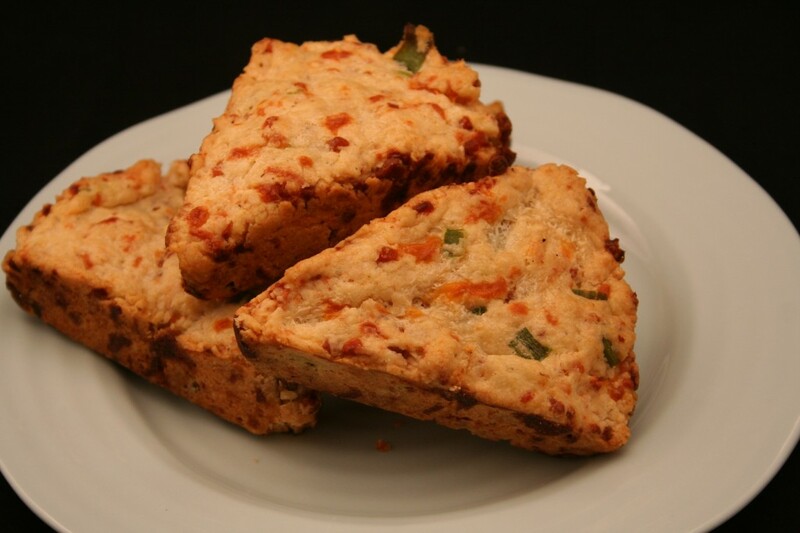 If you were making these at home in the oven you could form the scones by hand and bake them on a cookie sheet, but in trying to keep it as real as possible to our trip I broke out the Lodge Cornbread Wedge Pan, cleaned it up and dried it out. Because I was cooking over a fire (on the grill) I did grease the pan with some leftover bacon grease, which I think was a must. To get started I cooked my bacon, chopped it up finely with my Pampered Chef Chopper, its like the Slap Chop but way better, it allows me to easily chop the bacon extremely fine. Once my bacon was ready, I got a chimney of lump charcoal fired up and completed the recipe as outlined below. I then formed the scones into the wedges in the pan, brushed the top with cream and finished getting the grill ready. Then it was onto the grill on the cooler side, the side away from the coals. While the scones were cooking, being the meat eater I am, I plopped a steak on there as well. It took about 15 minutes for the scones to cook, which I judged by when the tops began to brown, once they were browned, using heavy gloves, I removed the skillet and promptly removed the scones. Then came the taste test, now I am not experienced in the likes of scones but what resulted was delicious, they we tasty and well rounded. No one taste jumped out more than another, the outside was a bit crispy on the bottom but the inside as flaky and delicious. I have had two since pulling them off and will likely get a third once I am done writing this. In keeping with the camping theme the recipe calls for the dough to be turned out onto a floured surface, well I don’t foresee myself using the picnic table so I practiced doing it all in the bowl and it worked out quite well. I can’t wait to make these later this week at camp, nothing quite like a little campfire gourmet to take a break from hobo pies and burgers. Happy Independence Day and eat well!